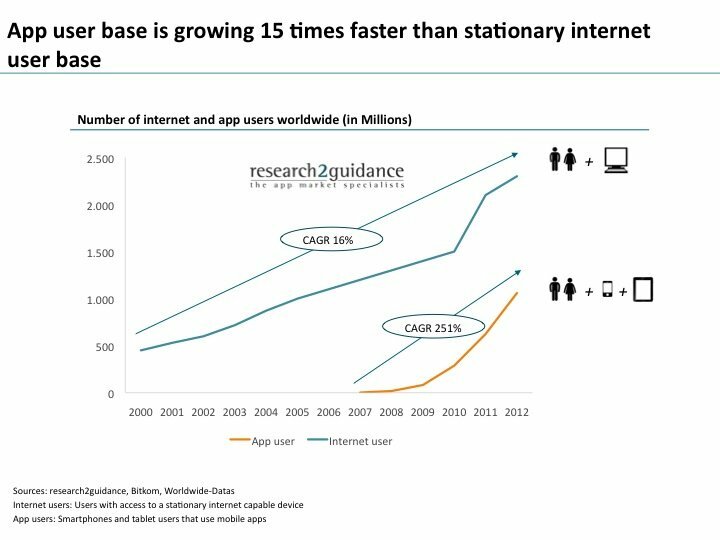 ﻿research2guidance - App user base is growing 15 times faster than stationary internet user base. What are the consequences? App user base is growing 15 times faster than stationary internet user base. What are the consequences? The growth rate of app users has been 251% (CAGR) over the last 5 years. It has outpaced the growth of the stationary internet users worldwide by an astonishing factor of 15. Stationary internet user base is still more than two times bigger than mobile app user base, but its growth rate (CAGR =16%) looks rather deplorable compared to mobile. There are 4 major implications every company has to deal with. There are many reasons for the massive growth of the app user base. The wide range of Apps is one of the main drivers. Apps and smart mobile devices create a win-win alliance that goes beyond the software-PC alliance. Apps provide the intelligence for smart devices to be used as a tool for almost every daily activity. The mobile device provides the technological basis but more important provides the context in which the app creates value for its user. There are no other mass market devices that users carry around 24/7, that are as personal and that provide location information at all times. Where does it all lead to? We continue our discussion on the impact the app-eco system has on the industry by highlighting 4 consequences this rapid market growth will have. The number of mobile app users will overtake stationary web users: This seems evident as there is no end in sight for the growth of mobile app users. Eventually a great part of today’s 7 bn (international Telecom Union) mobile subscribers will possess a capable device and will make use of apps. The biggest challenge will be to tap into the developing countries with their 5.2 bn mobile subscribers. It will be only a matter of time until the industry will pour out cheap capable mobile devices for far less than 100 USD to allow monthly subscription plans with ARPUs of around 5 USD. IT development will become mobile: If private and business users are mobile, IT solutions will have to follow. Mobile app development business has already become a multi-billion dollar business (see report: The Market for Mobile Application Development Services), but this is just the beginning. Enterprises will mobilize their IT solutions to provide e.g. mobile access to company databases as well as to reach out to their customers for marketing, sales and service purposes. Hundreds of thousands of IT developers will have to be trained in mobile programming languages as well as in GUI design and user flow. The IT service industry is about to realize these changes and the business opportunities this development will have in the next 10 years. The mobile channel will become a key strategy element for every company: There is no industry that is not affected by the new mobile channel. It will be a challenging task to create, develop, maintain and manage hundreds of mobile services on an increasing number of platforms and for a diversity of internal and external user groups. This task is not being addressed properly in the majority of the company strategy and operation units at the moment. 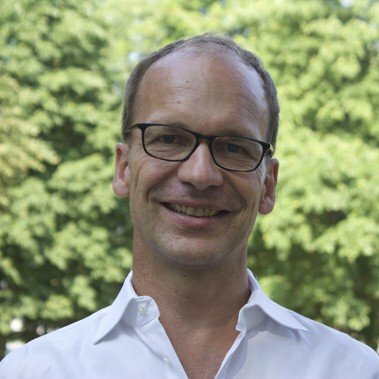 M&A will become hot: Because of the speed the market developments and the time it takes to implement changes within an organization, companies will open their pockets and start to buy apps and mobile service companies to keep up with the pace of the market. The first specialized service providers like Apptopia have jumped on the train and offer matching services for buyers and sellers of apps. Apple’s new App Transfer service also facilitates the ownership changes of an app business. Regardless of the time scale, this inevitability makes your mobile/app and web strategy in the long run more important than your PC/web strategy. To get the stats behind these market changes, read research2guidance’s “The Smartphone App Monitor Vol. 10”, the comprehensive source of app market analysis. We invite you to comment and tell us your thoughts on the future of the app market and its consequences for app developers and publishers. An app user is defined as someone who has downloaded at least one app. Someone who owns a mobile device, which is capable of downloading and running a mobile app that is available in one of the more than 180 apps stores. Capable devices are smartphones, tablets, but also other devices like the iPod Touch.